We would like to introduce SHOWDOWN CAMDEM'S CARMA"S GUNA GET YA. Grand sire's are CH CAMDEM"S WHERE DID WE GO RIGHT and CH EMERALD KING. Camdem just started in the show ring in 2011. Camdem doing what he loves best (Fetching). Camdem entered his first fun match in Farmington, Utah January 30th 2011. Camdem won Best Of Breed Puppy and went on to take 4th in group. Camdem Entered in Farmington fun match Feb. 2011 and he won his Puppy Class. I entered Camdem in his first 4 day AKC show in Denver Co. Feb. 18th thru Feb. 21st. Camdem won Best Of Breed Puppy and went to Group he placed 5th out of 30 other puppies. Camdem won his AKC Puppy Class 3 out of the 4 days in Co.
Great job Camdem for your first AKC Show. Riverton, Utah May 2011 Camdem won his Class 6-9 months 3 out of 4 days. Camden took Reserve Dog he was entered in the 9-12 month puppy Class. Camdem took reserve in the 12 to 18 month class in May of 2012. 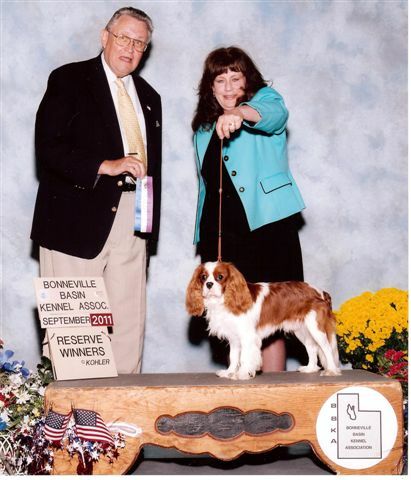 Pedigree includes ENG CH Lymrey Royal Reflection Of Ricksbury (Blenheim Cavalier) (Born 1993) (5 yrs heart clear) One of the Most famous Blenheim's in the World. Camdem's pedigree has multi, multi champions in his pedigree. Ben (Camdem) is retired but I still have his wonderful line, and he is still OFA Heart Certified and eye certified at thirteen years old. Camdem waiting to get groomed for the Blackfoot dog show. Entered in the 12 to 18 month class. Camden jumps on the grooming table all by himself he loves being groomed. Below is SHOWDOWN CAMDEM'S CARMA"S GUNA GET YA taking Reserve in Farmington, Utah he was in the 12 to 18 month class.